We reported last month on the overblown Treasury estimates of the costs of setting up the additional departments an independent Scotland would require following Independence. In a report released on Sunday, Transitioning to a new Scottish state, Professor Patrick Dunleavy of the London School of Economics (LSE) sets out the assessment of the LSE Public Policy Group on the costs and savings of setting up the departments an independent Scotland would require. ‘Every transition to a new state has some uncertainty and a degree of risk. But there are no bases for extreme anxiety about an independence transition in Scotland. Professor Dunleavy reiterates his assessment, last month, of the set-up costs as – up to £200 million. The Treasury mistakenly misused a calculation Professor Dunleavy provided to the last Labour government on the costs of setting up a new major Whitehall department by applying this calculation to the cost of establishing180 public bodies in Scotland, many of which are already in existence. The Treasury’s first £2.7 billion calculation was then revised, but conflated the IT costs of new systems in their revised calculation of £1.5 billion. As Professor Dunleavy points out these are longer-term investment costs with potential to generate long-term savings and are subsequent to the establishment of a new department. The LSE report has identified the six directorates the Scottish Government presently operates would be expanded to nine reconfigured directorates. At present the Scottish Government operates with 5000 civil servants and this would be expanded to around 27,000 with the transfer of civil servants, already working in Scotland for HMRC and the UK Department of Work and Pensions. Professor Dunleavy writes that there would be ‘a big change in the scale of the civil service, but not much change in how it operates’ in Scotland at present. The Civil Service structure in Scotland follows a modern governance ‘directorates’ structure that the report describes as an effective way of organising, in contrast to the deeply embedded ‘silos’ of Whitehall departments. The LSE authors have identified 206 UK public bodies relevant to Scotland and have put forward their assessment of the number a modern governance structure, as operated in Scotland, would require to complete the transitional process to full statehood. Reducing 206 bodies by 70 to 136 represents a cut of a third and would achieve considerable long-term efficiency savings. Referring to a 2010 study examining changes to Whitehall departments over a 30-year period, Professor Dunleavy writes, ‘we heard many horror stories of the incredible behaviour of UK Prime Ministers in forcing through badly designed changes of departments over a weekend. ‘In one extreme case a top minister was two minutes away from arriving at his new department during a cabinet reshuffle and Whitehall reorganization, when the department was suddenly merged by the PM with another one. The minister had to be made Foreign Secretary to compensate him for the shock of it all. He notes that IT is cheaper and more effective in states with a population of 5 to 10 million and cites Sweden as an example of a country with more modern and flexible systems. 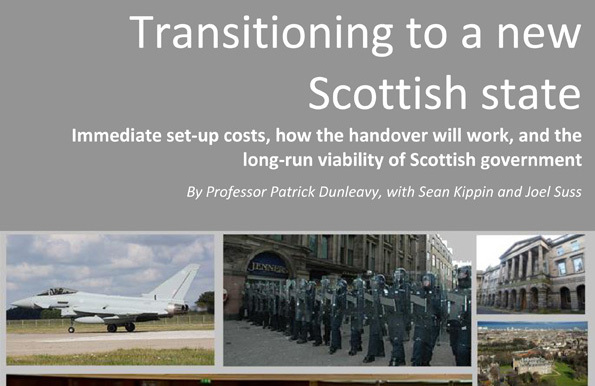 Professor Dunleavy examines, in useful summaries, key examples of costs and savings in the establishment of the Scottish Security and Intelligence Agency (SSIA), The Scottish Defence Force, Foreign Affairs, and Taxes and Benefits departments to fully complete the transition process. This entry was posted in Economics of Indepenedence, Economy, Politics, Uncategorized and tagged Independence, LSE, Professor Dunleavy, Scotland, Transition costs and savings. Bookmark the permalink.